The widow of slain tantra teacher for the first time described how authorities broke the news that her husband had been shot dead and how she went to the spot in Fairfax where he was killed and did a "heart salutation for him, honoring his body, knowing his spirit was already in the light." Lokita Carter took to writing her feelings on her cancer blog for the first time since Steve Carter, 67, was killed Oct. 5 while hiking with his red Doberman Pinscher, Coco. 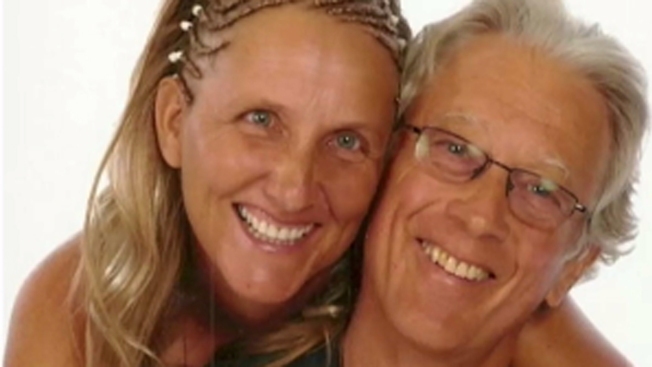 Three suspects were arrested in Portland, Oregon, two days after Steve Carter's killing. Police said investigators tracked then down using the GPS technology in Steve Carter's stolen Jetta. Lokita Carter has not spoken publicly since her husband's death, and took down her blog immediately after he was killed. But on Sunday, she began writing again, describing how four officers knocked on her door at 3:45 a.m. and asked in a foreboding tone: "Are you Mrs. Carter?" Then they began with, "We are sorry to inform you..." Her husband of 17 years was shot dead. Her dog was shot, too. Her car had disappeared. Lokita Carter said she had no single word to describe her anguish. She wondered why she didn’t go to the beach with her husband that day "like he had wanted. Why? Why WHY?” she wrote. She went to visit the spot where Steve Carter was killed and made a little shrine. "I sat down on the earth, and entered into sacred space with Steve," she wrote. "In the background, my precious friend Om recited the Phowa ritual, as Steve’s disembodied presence and I meditated together on the light and his soul, his spirit, ascending his body." The Carters had founded the Ecstatic Living Institute, where they taught tantric ecstasy seminars and workshops to thousands of people from Middletown, California. They had moved to Costa Rica for a while, but returned to Marin County to stay with a friend as Lokita Carter sought treatment for breast cancer – all detailed in her blog and fundraising page. Lokita Carter also described sitting with her husband’s body at the morgue, "looking at his face, just waiting for him to open his eyes." "His beautiful blue shining eyes," she wrote. "But no, they did not open. He was gone. The man we knew as Steve Carter was no longer in the body I saw in front of me." She also vowed to work through the pain. "Life will go on, yes," Lokita wrote, "and time heals all wounds, yes, but right now it is excruciating." The arrest and extradition of the trio — Sean Michael Angold, 24; Morrison "Haze" Lampley, 23; and Lila Scott Alligood, 18 — accused of murdering Carter provided some comfort to more than a dozen of his friends who gathered Tuesday at a small shrine where he was shot. Ashanna Solaris, who had known Carter for 20 years, expressed relief at knowing that justice will be served. "At least now we know who did it," she said. "Even though it’s awful and they were so lost to do something like that, at least we have the comfort of knowing there’s not a murderer running around somewhere."